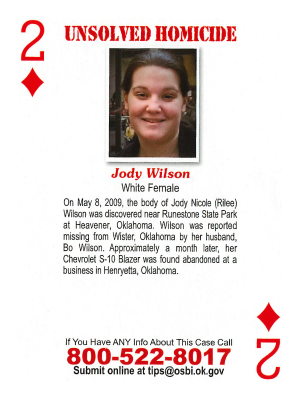 On May 8, 2009, the body of Jody Nicole (Rilee) Wilson was discovered near Runestone State Park at Heavener, Oklahoma. Wilson was reported missing from Wister, Oklahoma by her husband, Bo Wilson. Approximately a month later, her Chevrolet S-10 Blazer was found abandoned at a business in Henryetta, Oklahoma.